(NC) As winter winds down and the warmer weather starts melting the snow on your roof, be aware of the potential threat of ice damming, which can cause damage to both the exterior and interior of your home. An ice dam is created when rooftop snow melts during the day and then freezes again at night around the edges or eavestroughs. As this barrier of ice gets bigger, it prevents further melting snow from draining off your roof. When water has no way of getting off your roof, it pools there and backs up under the shingles and into your home, where it can cause damage to the wood structure, insulation, ceilings, wall finishes, furnishings and personal belongings. On the outside, ice dams are not only a safety concern – they can also cause damage to eaves and lead to the buildup of a white, powdery residue (known as efflorescence) on concrete and brickwork. 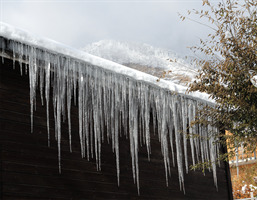 The best thing you can do is to prevent ice dams before they happen. Soon after a snowfall, use a roof rake to remove snow from the first metre of your roof. If you currently have ice buildup on your roof and want it removed, consider hiring an experienced professional to do it for you. Do not climb onto the roof to try and clear snow or ice – you can damage your home and seriously hurt yourself. Throwing salt or de-icing chemicals on roof ice is also a bad idea, as this may cause shingles to deteriorate. Does your new home warranty cover it? If you own a newly built home, your warranty may cover problems associated with ice damming if they are the result of a building defect. If you’re unsure, contact Tarion at tarion.com. Attention Editors: This content is reserved for distribution in Ontario only.